I love the way the illustration style goes from extremely realistic in the background, to more abstract and cartoony with Jonny in the middle-ground, to very cartoonish with Bandit the dog in the foreground. You rarely see this kind of layering of abstraction in American comics, where the style tends to remain the same throughout. 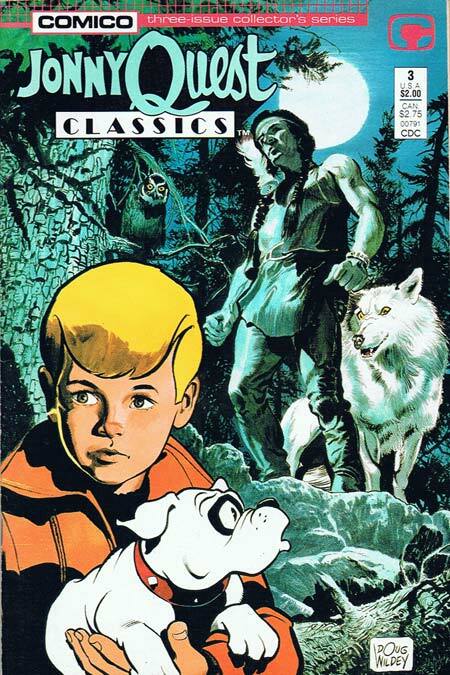 You feel more sympathy for and empathy with more abstract, more cartoonish characters like Bandit, while the more realistic Indian and his wolf -- being more concrete and visually informed -- are scarier. Look at the detailed line work of the tree, for instance, compared to the completely linear and hatch-free inking on Bandit. The coloring takes this even further. Jonny gets some nice color shading, halfway between the very tonal background and the stark black and white of the dog. I also love the use of cool blue tones for the background layer, progressing to warmer reds and oranges in the foreground. Color itself provides movement, pushing the background further back and pulling the foreground further forward, ironically making this cover more animated than most of the t.v. show's moments. An excellent cover by one of illustration's icons, Doug Wildey. I also appreciate that Comico opens the issue with an inside-front-cover short biography of Wildey, and couples that with a lengthy three-page interview with him in the back. There's one particularly good bit where Wildey (who was the main designer for all of the Quest characters) talks about Jonny's lack of a hair part, and what a pain it was for the animators. Perhaps those elements contribute to the book's "hand-crafted" feel, something completely lacking in the animated series; you get the sense that this has been produced by someone who cares about what he does, a far cry from the soulless corporate hackery that doomed so many of Hanna-Barbera's offerings. The story itself is just so-so, featuring gold-smuggling Canadian loggers dressing up as werewolves, and ... wait a minute, now that I write that out, it sounds awesome! Go Jonny! IIRC, that was the idea behind an episode of the original series. I’ll betcha that book is a comic book version of the episode. Also I never realized until this moment that “Jonny” was spelled J-O-N-N-Y. I used to watch Johnny Quest all the time on TV. It was a strange show where real people’s mouths were used in the cartoon. I remember watching that instead of the story. Great that you have it here!